WHY FUND AIR POWER AUSTRALIA? 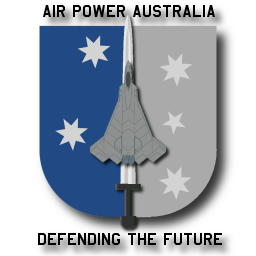 The Air Power Australia website was launched in 2004 with the intention of providing a platform for public, professional and media education, using open source materials. Since then the website and visitation traffic to the website have grown beyond the expectations of its founders and earliest contributors. The Air Power Australia website has become a widely referenced source, used especially by training and educational establishments. The success of the website is a direct result of the foundation policy adopted, namely: that the truth must come first, whether it is a nice truth or a not so nice truth. The policy of putting the ground truth ahead of what many potential sources of research and operational funding might like to see has had one undesirable consequence, which is that all research, publication, and other reform and public education activities undertaken by Air Power Australia have had to be funded through the generosity of its founders and contributors, none of whom have been directly or indirectly remunerated for their time and effort, or the large volume of copyrighted materials posted on the website. Unlike many organisations in the defence sector, including many government entities, Air Power Australia does not and will not trade away the truth in exchange for funding. Maintaining and growing the website, performing research material collection and analysis, and conducting policy reform activities such as the production of submissions to legislators, are all activities which require time and effort by highly experienced and expert contributors. Donating funding makes such activities significantly easier to perform, as it reduces the very large opportunity costs to Air Power Australia's founders and many contributors.